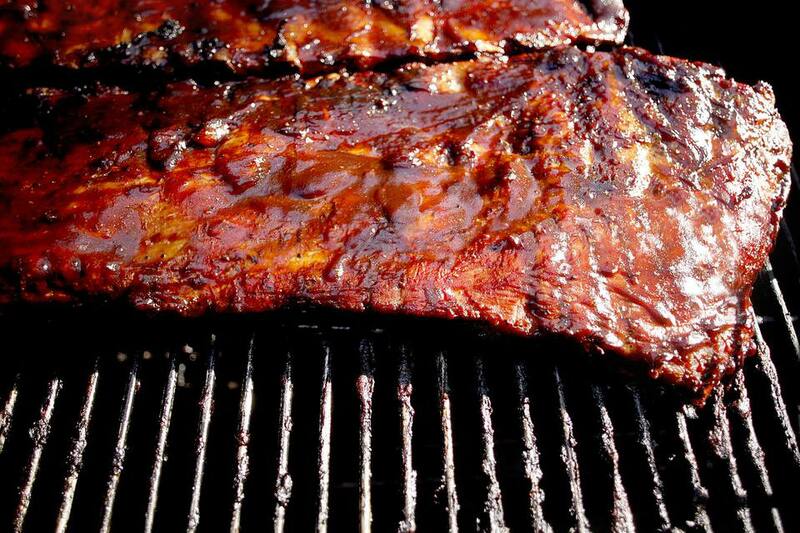 This beef rib basting sauce has the right amount of vinegar to keep the ribs tender and moist. It also has a slightly sweet but mildly spicy flavor, which will produce a tasty rack of beef ribs. While pork ribs don't need much in the way of a mop sauce, beef ribs benefit from the additional flavor. This type of basting sauce is also called a mop sauce. It is applied with a barbecue mop tool rather than a basting brush. You don't want to disturb the tasty rib rub that you coated the ribs with before you began smoking or slow-grilling them. A mop tool looks like a miniature kitchen mop. The cotton strands help deposit the liquid mop sauce onto the meat without brushing away the rib rub. Alternatively, you can use a spray bottle to apply the mop sauce. Just make sure that the spices are finely ground so they don't clog it up and that the sugar is well-dissolved. You can warm up the sauce a bit to help them dissolve. Mix the dry ingredients in a nonreactive bowl (paprika, chili powder, cumin, brown sugar, black pepper, oregano, white sugar, salt, and cayenne). Add wet ingredients (cider vinegar, soy sauce, water, Worcestershire sauce) and mix well. You may heat it briefly on the stove or in the microwave if needed to dissolve the sugar. Use as a mop sauce when smoking or slow-grilling beef ribs. Once the ribs have reached 165 F, begin basting. Turn and baste the ribs with the basting sauce every 10 minutes, until they are finished cooking, about 1 1/2 hours. If you are not using the sauce immediately, you can store it in the refrigerator in an airtight container for up to one week. Allow it to come to room temperature or warm it a bit before using it on the ribs. As this mop sauce has sugar, it's best to use only when smoking or grilling below 265 F. Sugar burns when it is above that temperature for too long. If you are using it when grilling at a higher temperature, only use it at the end when it won't be on the heat too long. For food safety, it's best to pour out the amount of mop sauce you are going to use for each application into a small dish. That way, you won't be transferring bacteria from the cooking meat to your larger container of sauce. Using a spray bottle prevents this contamination.